This symposium discussed the relationship between artefacts and ritual acts and posed the following questions. Can artefacts cross boundaries in terms of their intended use? Can objects become ‘sacred’ outside of religious frameworks and what enables this transcendence to take place? How relevant today are ‘rites of passage’ and what part do objects play within them? It provided a forum to engage with the emotive and symbolic nature of objects and stimulated discussion about how other disciplines inform current practice. 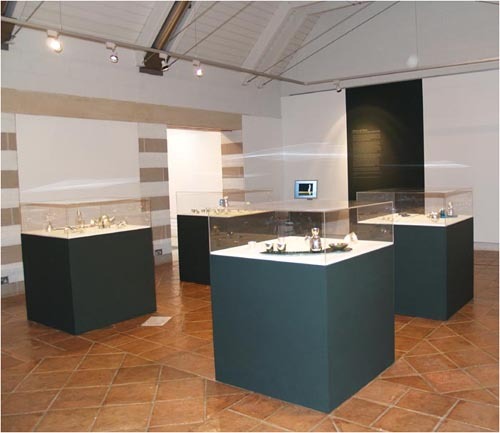 It coincided with an exhibition of new work in silver by Maria Hanson and Chris Knight. Academic & Design Historian. Principal Lecturer in Arts and Media in the Faculty of Creativity and Culture, Buckinghamshire Chilterns University College. Her specialism is critical discourse in contemporary crafts practice. Research Reader; Metalwork & Jewellery, Sheffield Hallam University. Practitioner: Current work crosses the boundaries between objects that relate to the body directly through wearing and objects that engender a physical interaction through use. Editor of ‘Morf’ critical design magazine. Academic, Historian, Curator. Senior Research Fellow at the V&A. Archaeologist. Lecturer – Archaeology, Manchester University. Research interests – The Late Bronze Age – Late Iron Age of Europe; funerary archaeology; material culture and representation; Analysis of relationships between objects, place, and identity. 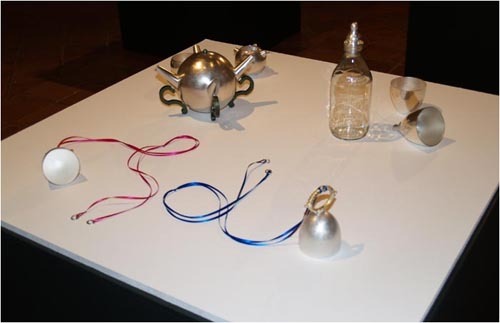 This presentation will use the exhibition ‘Objects and Ritual; New work in silver by Maria Hanson and Chris Knight’ as a focus to discuss how the creation of contemporary objects can be informed by established ideas within ‘ritual theory', ‘historical studies’, ‘archaeology’, and ‘material culture’. It will discuss whether the Althusserian model that ‘Ritual practices are produced with intent to order, rectify or transform a particular situation’ is relevant within contemporary society and how this might influencethe creative process. It will seek to define how and what we understand to be ritual acts and reflect on the value and function that objects play within them. Focusing on certain rites of passage and the fundamental ritual acts of eating and drinking it asks; Do objects that we own and use define who we are and enhance our experience of the ordinary? The Craft Object in western culture is in its essence different from mass produced Products. How we read these objects and understand their relevance in contemporary culture is an issue for debate. Do handmade objects stimulate a more intimate relationship with the user/wearer that creates certain emotional attachments thus giving the object a longer life cycle? Objects and Ritual .......Function - Value - Adornment. This is a very good theme for a symposium at this moment in time. When is a cup a chalice? What do we hold in our hands when we pray, to a god, to fate or chance? What do we value most, the precious necklace of gold and stones or the plain ring that belonged to our grandmother? To find an answer to these questions, or at least to analyse some of the underlying currents, I want to distinguish 4 main players or parties in the field we are working in. And the time we are living in. The reason that rituals and values are a good subject at this moment is the factor time. If I sum up the main developments in the 20th century for the fields of art, craft and design, I am not talking about the cool beauty and the principles of Modernism, nor for example about the devastating effects of two World Wars. In my opinion, the inheritance of the 20th century that matters most in the way people live and experience the world around them, is the breaking down of social and religious structures to the bone. The cult of individuality has by now reached a pinnacle, with so many people living alone, or anyway making their own choices in life, feeling that they themselves are responsible for their own wellbeing, and still missing so much. There is such a lack of shared experiences, of coherence; where everybody is an individual that has no meaning or value anymore. The cult of individuality is what I call the main disease in the fields of art, craft and design. How can you make things that people will value and give a room for in the rituals of their daily life? Is that possible? The bottom line is, may be not, but what makers can do is not only excel in the love of making things, in the choice and handling of the materials they use, but also open up to the needs of the people around them, the people that they want to reach with their work. What they have to do if they want to get out of the dead end of introverted ness, is to relate to the world around them, to what is happening in society and hopefully find something there that can be appreciated, or even loved. If they can put that into well made work, then they have at least a better chance of people relating to it in return. This paper brings an archaeological perspective to bear on the role of objects in the making of identity. Using a case study from Iron Age East Yorkshire, it evaluates the role and meaning of decorated objects such as swords, mirrors and boxes, within a series of burials. It considers what we mean by the term ‘ritual’, questioning a simple division between ceremonial and mundane activity. By focusing instead upon contrasting arenas of performance, it explores how these objects achieved powerful effects upon users and viewers, becoming intimately entwined in people’s biographies. This will include a consideration of visual qualities such as colour and luminosity, oral effects of rhythm and noise, and the tactile qualities of different materials. Finally, it highlights how relationships are formed between things and places, through similarities in substance and appearance, as well as the durable marks and memory traces left in the landscape. Alcohol has many attributes; from ancient times its power to transform mind and body has been associated with worship and celebration. It brings pleasure, it alleviates pain, and it promotes good fellowship. Almost all societies have evolved rules and ceremonies to temper and ritualise its consumption, testing courtesy and self-control through drinking games. In the European tradition a rich material culture has evolved over the past four centuries.